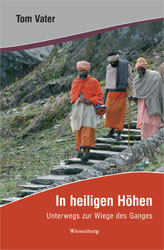 Tom Vater’s non-fiction book on the source of the Ganges, India’s holiest river, is published by Wiesenburg Verlag (Germany) in March 2008. This entry was posted on Wednesday, February 4th, 2009 at %I:%M %p	and is filed under . You can follow any responses to this entry through the RSS 2.0 feed. You can leave a response, or trackback from your own site.